Bless Box October 2018 Spoilers + Coupon! We have a look at the October 2018 Bless Box! For the month of October, join Cindy Crawford & Sazan Hendrix to experience the exclusive Meaningful Beauty® x Bless Box collaboration and receive over $300 in hand-selected skincare essentials from Cindy’s personal beauty line. Unbox your newest skincare addiction. Each product is hand-selected to enhance, nourish, protect, and revitalize skin at every age for your most beautiful you. Enjoy a full skincare routine curated just for you by Sazan and Cindy! Experience lasting and timeless beauty with each step. Each item in this box is hand-selected to provide you with the ultimate luxurious skincare routine. From the Skin Softening Cleanser to the Overnight Retinol Repairing Crème, we’ve got you covered babe! Discover our favorites and discover what beauty means to you. 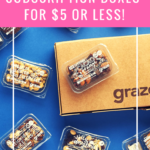 COUPON: Use code MSA35 to save 35% off your first box! The Products: Each box will include items in the beauty, health, food categories. Check out all of our beauty boxes the Beauty Subscription Box Directory! What do you think of Blessed Box’s October spoiler? So…is this entire box just the Cindy Crawford stuff? “receive over $300 in hand-selected skincare essentials from Cindy’s personal beauty line.” That’s what it sounds like to me. Has anyone even tried this line? Is it any good?